Potty training animals on your homestead may sound crazy, but there is a good reason to do this. If you have any property with a pond and a few ducks, then a mess is often assured. If you know how to potty train ducks, then this will not be an issue. If you tell people to potty train ducks, then they may give you a funny look. What you are really doing with a group of ducks is making sure they do their business in a specific area. Duck poop is an awesome thing to use as natural fertilizer for fruit trees and other crops. 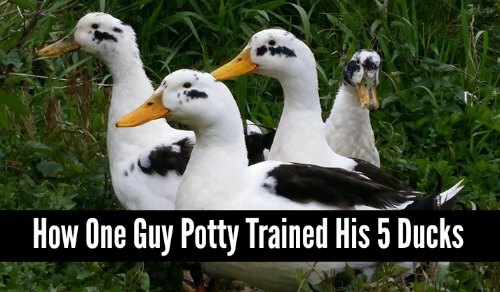 A lot of dedication is needed to potty train ducks on your property. If you take the time to make sure that your ducks do their business where you want, then reduce the amount of time spent fertilizing the garden, and you’ll have a cleaner yard .